Robert Campagna has lived in Loveland, Colorado since 2007. 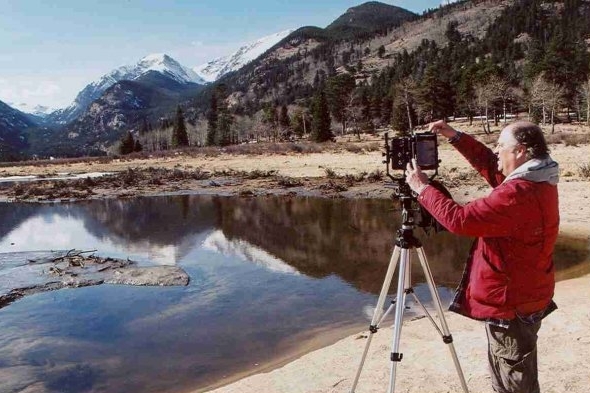 His primary medium is black and white film; shooting landscapes, portraiture and Americana. He has created and taught almost 400 workshops for youth, adult, collegiate and community groups, in numerous locations throughout Colorado and Iowa as well as in New Mexico, Wisconsin, Illinois, Minnesota, California, New York, Nicaragua, and Scotland. All told, he has taught over 10,000 students. In September, 2010 completed his fifth volunteer stint since 2005 in Yosemite National Park where he works for the Yosemite Conservancy in a variety of information capacities. In February, 2011 he opened a solo exhibit of his regional Colorado work at the Loveland Museum of Art. The exhibit was titled: “EYE DANCE: In Honor, Beauty and Place.” The exhibit is produced through traditional black and white print film and paper. It was a 50 piece retrospective of his 10 years as a teaching artist in Loveland and the nearby region. Periodically, he lectures on Ansel Adams, explaining Adams’ work through his own personal excursions into Yosemite National Park, tracing Adams’ path from decades earlier. In his long time hometown of Mt. Vernon, Iowa he was a co-founder of the ARTworks Gallery and the Mount Vernon Area Arts Council. In Loveland, he is affiliated with Art Works Loveland, an artists’ collective. Campagna is a board member and president of NOVO restoration in Loveland.